Experience the beautiful northern California coast from the comfort of this Crescent City hotel near the Redwood National Forest Headquarters, and with breathtaking views of the Pacific Ocean! Just a short scenic drive from the Redwood National Forest, the Best Western Plus Northwoods Inn is perfect for business and leisure travelers alike. Many visitors enjoy the whale watching, fishing and surfing contests along the Pacific Coast. 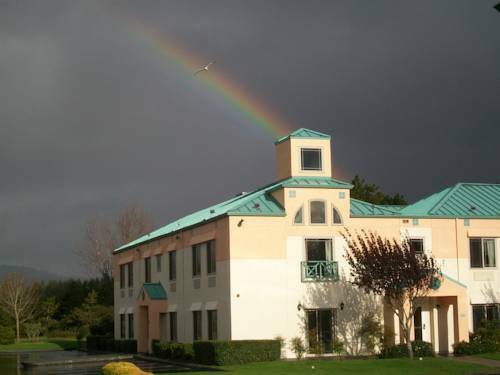 Guests at this Crescent City hotel are across the street from the Crescent City Harbor District, and are just minutes away from top-notch golfing at the nearby Kings Valley, Del Norte and Salmon Run Golf Courses. And whether you choose to hedge your bets at Elk Valley Casino or enjoy a family adventure at Ocean World, theres plenty of fun to be had in the area. Conveniently situated on Highway 101, aptly named the Redwood Highway, this northern California Best Western makes it convenient to do business in Crescent City and surrounding areas. Local businesses, like the Sutter Coast Hospital, Del Norte County Fairgrounds, Pelican Bay State Prison and Jack McNamara Field, are all within a short drive. Also, our business center and flexible meeting space accommodating up to 20 guests make us an ideal meeting and event facility in Crescent City. The Best Western Plus Northwoods Inn is proud to offer superior customer service and unbeatable amenities at an affordable price. Guests staying at this Crescent City hotel will enjoy cable satellite television with HBO , free high-speed Internet access, and a complimentary breakfast each morning. Guests are encouraged to relax in the hotel's indoor heated swimming pool or to recharge in the fully equipped exercise facility. For added convenience, guests can enjoy delicious fare at the on-site Sports Bar & Grill at Northwoods. Make your next adventure to northern California unforgettable by reserving your stay at the Best Western Plus Northwoods Inn today! From: US 101. Head south, continue .25 miles past the business district, the Best Western Plus Northwoods Inn is located across from the marina. ~18 miles from Crescent City. ~23 miles from Crescent City. ~63 miles from Crescent City. ~66 miles from Crescent City.